The tradition of sending Christmas cards is thought to have begun in the 1840's in England by Sir Henry Cole who first commissioned an artist to make several identical pictures when he found himself short on time and unable to handwrite Christmas greetings to all of his friends (sound familiar???). The idea took off in England, but mass produced Christmas cards didn't reach North America until 1875. (Source: Sir Henry Cole Penny Post) Now, almost 2 BILLION Christmas cards are sent across the miles to family and friends! (Source: US Census) I'm sure glad I don't have to make THAT many! But I do like to make my own cards, especially Christmas cards, and today I want to share 5 Card-Making Tips, Tricks and Ideas with you! Make use of your scraps. As I work on scrapbook layouts or other projects, I save any scraps that are big enough to make use of - probably a 2 inch square or strip would be the smallest I keep. I toss them into my scrap drawers that are sorted by color for easy reference. When I need to make a card, I look in the the scrap drawer first for little pieces I want to use up. Keep basics on hand. I like to have a package of white 8.5 x 11 cardstock around. When I need a card base, I cut a sheet into two pieces that measure 4.25 x 11. When folded it measures 4.25 x 5.5 which is the measurement of "invitation" size envelopes that I buy in bulk at an office supply store. Think "assembly line". When you need to create a large number of cards do each of the tasks all at once. For example, cut, score and fold all the card bases. Cut or punch all the pieces you want to add to the card. Stamp or add your embellishments or color or paint. Add ribbons or brads. Finally adhere all the prepped pieces together. This is much more efficient than creating each card one at a time from start to finish. Keep it simple. The beauty of a handmade card is in the thought behind it and the time you took to create it, not in the fact that you used the latest product or the most complicated technique. Make it attractive, suitable to the occasion and write a sincere sentiment on the inside. That's what will matter most to the lucky recipient! Repeat, repeat, repeat. When you find a design that works and that you like, use it often! By all means change up the colors/papers you use, round the corners, use a button instead of a brad, or stamp a different messge, but keep the basic design the same. You'll save lots of time and creative energy! So here are a few SUPER simple designs to get the inspiration flowing. Feel free to copy or adapt as you see fit! 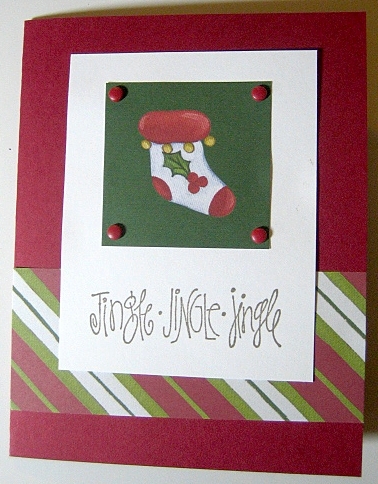 "Jingle Card". Use a red card base. Add a strip of striped or patterned paper across the bottom, about a third of the way up. Cut a piece of white cardstock and stamp a greeting near the bottom. Add an image cut from patterned paper, or a sticker or a stamp to the top portion of the white rectangle. Add four brads in the corner of the image to help it stand out. 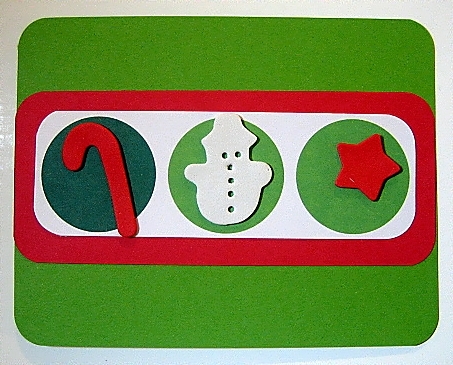 "Christmas Circles Card". Use a card base in green. Round all the corners. Cut a piece of red cardstock and round the corners. For the circles, I used a piece of patterned paper that had large circles on it, but you could get the same effect by punching out 3 large circles and mounting them on a piece of white paper. Round the corners of this piece as well. Mount on top of the red strip of paper. Add a Christmas themed foam shape from your kids craft bin onto each circle. I love the dimension and texture foam gives. This is a great and easy project for kids to make and give! "Happy Holidays Card". I got this great design from my colleague Tina who is a Stampin' Up Demonstrator. 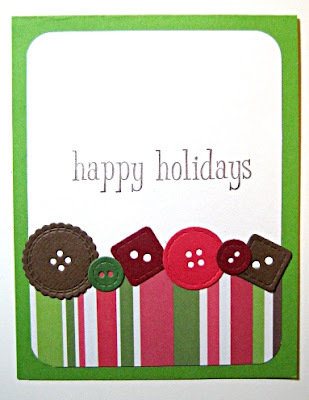 Use a card base in green (or whatever color that would coordinate with your patterned paper.) Cut a white piece of cardstock. Round the top two corners and stamp a greeting in the middle of the piece. Cut a striped or patterned paper the same width as the white cardstock and about 1/3 the height. Round the two bottom corners. Adhere both pieces with their straight sides together. Mount punched shapes like buttons, stars, hearts or circles over the seam where the two papers meet. More advanced card-makers can certainly dress them up further by inking or distressing the edges, embossing stamped images and adding extra embellishments such as ribbon. These are the basics...but the sky is the limit! Don't let time, lack of supplies or lack of inspiration stop you from making handmade cards for your family and friends this year! We'd love to see what you come up with, so if you make some cards, post a pic and send us a link in the comments below! Make sure to come back tomorrow to check out some tags, and to take part in our first challenge! i really like the Happy Holidays card! very pretty and looks quick and fun!